District Court vacancies through official website of www.drcmurshidabad.in. 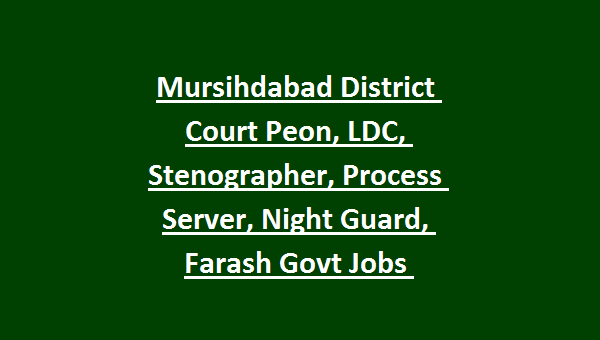 The application form must be submitted online before the closing date of 15-12-2018 for this Murshidabad Court Peon, Lower Divisional Clerk, Process Server and Stenographer posts. Written exam, stenography test/skill test will be conducted for this Murshidabad District Court recruitment 2018. Post wise exam pattern and syllabus, qualification and other details are given below for this Murshidabad District Court Peon, LDC, Stenographer Jobs recruitment notification 2018. There are total 50 posts are in this Murshidabad court recruitment. Age limits cut off date is 01-01-2018. For Stenographer posts upper age limit is 37 years. Upper age limit is 40 years for general candidates. For SC/ST candidates 5 years and for OBC candidates 3 years of age relaxation is given. For Stenographer and LDC posts candidates must have passed madhyamik and computer knowledge is required. For Group D posts 8th passed candidates are eligible to apply. For Group D posts written exam will be conducted. 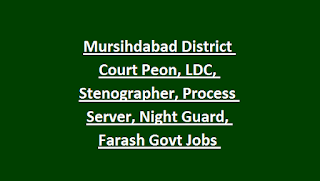 Candidates who are looking for Court jobs in Murshidabad they can apply online for the above said posts before the closing date of 15-12-2018. Official website to apply online is www.drcmurshidabad.in.